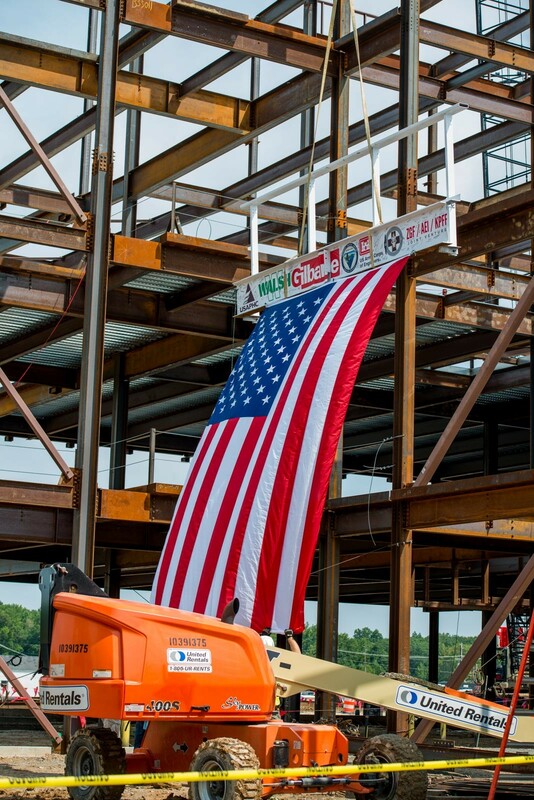 The Army Public Health Center commemorated the finishing of steel construction for its new laboratory replacement facility with a Topping Out ceremony August 16 at 10:30 a.m. The ceremony took place at the building's construction site on Aberdeen Proving Ground-South. In building construction, "topping out" is a ceremony held when the last steel beam is placed at the top of a building. This tradition migrated to America with European craftsmen. 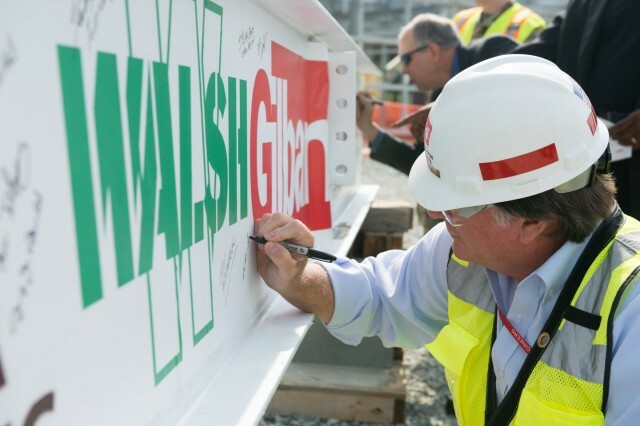 The topping-out beam is signed by those who were significant throughout the building's construction and the American flag is displayed. For APHC's Topping Out ceremony, guests signed a beam that was painted white and displayed the logos of the Army Public Health Center, Health Facilities Planning Agency, U.S. Army Corps of Engineers, Walsh-Gilbane Construction, Aberdeen Proving Ground and the ZGF/AEI/KPFF Joint Venture construction team. In addition to the signatures and logos, commemorative coins were also attached to the beam from these organizations. Maj. Lyndsay Knoblock-Fast, the executive officer for the Deputy Chief of Staff for Public Health, U.S. Army Medical Command, narrated the ceremony; Lt. Col. Michael King, the Aberdeen Proving Ground chaplain, conducted the invocation; and Col. Robert von Tersch, PhD., director of Laboratory Sciences at the APHC, narrated the APHC's history of the laboratory renovation initiative. In the history presentation, von Tersch explained the progression of APHC from its start to its current form. "The lineage of the Army Public Health Center can be traced back more than 70 years to the Army Industrial Hygiene Laboratory, which was established at the beginning of World War II under the direct jurisdiction of the Army surgeon general," von Tersch said. "This early laboratory was originally located at the Johns Hopkins School of Hygiene and Public Health; it had a staff of three and an annual budget of $3,000." He explained that the new laboratory facility would optimize the current and emerging public health missions at APHC. 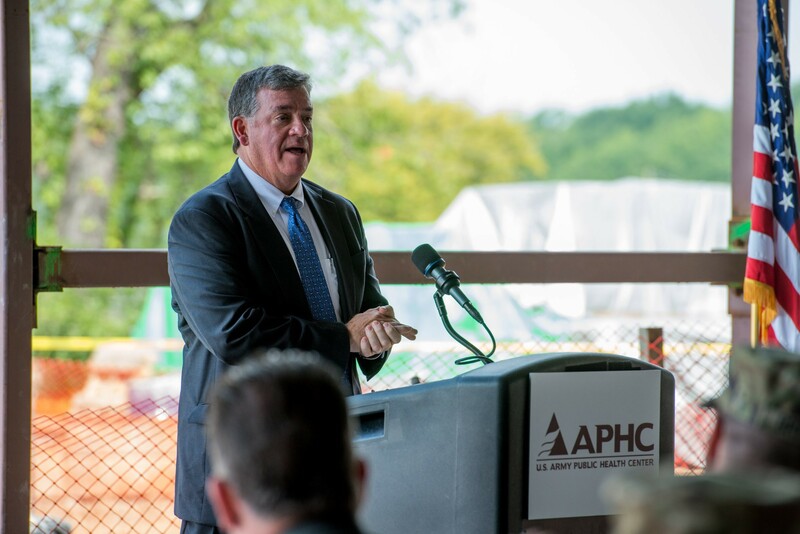 "The new laboratory will allow staff from various APHC directorates to work in one location and with shared logistical and operational assets, in a space of approximately 279,000 gross square feet," he said. Col. Edward Chamberlayne, the commander for the U.S. Army Corps of Engineers, Baltimore District; Col. Michael Brennan, the commander for the U.S. Army Health Facility Planning Agency; Kevin Swain, the vice president of Walsh-Gilbane Joint Venture, and John Resta, the director for the Army Public Health Center, all gave remarks showing their excitement for the progress the facility has made. Chamberlayne and Brennan spoke about the joint effort of all parties involved in the planning and execution of the laboratory facility construction. They both noted what the future holds for Army public health and its potential to grow and prosper in the new facility. Swain reflected on the progress the construction crew has made from the groundbreaking ceremony to this point. He said he was honored to have a part in the facility's construction and promised to see it to completion. Resta noted that the completion of this building was a major goal of his career and proposed a single suggestion to the crew, to have it finished faster. He expressed gratitude to all of those involved in the process and said he believed the new facility would allow APHC to further its mission. "A primary mission of the Army Public Health Center is our role in identifying and assessing those chemical, biological, radiological and physical hazards that threaten our Soldiers, their families and Army Civilian employees in deployed locations, on installations and in our workplaces worldwide," he said. 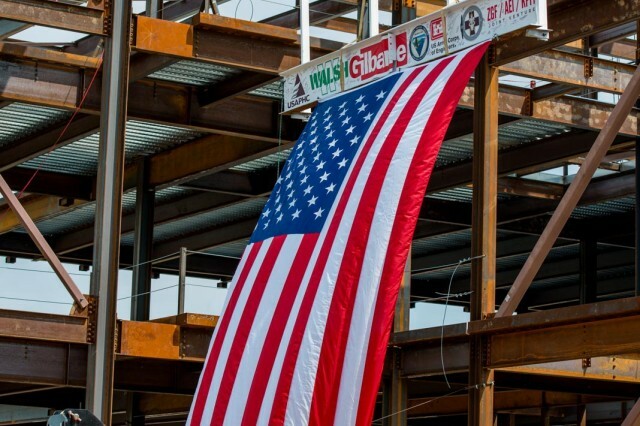 Nearly 200 attendees watched as the topping-out beam was set in place at the construction site, unfurling the American flag as it reached the top of the building. Guests gathered for refreshments following the ceremony.